Out of war-torn China has come a young futurist artist who senses the soul of the world. This tousled-headed boy of 20 left Saturday on the S S Lapland for Paris to exhibit his paintings; to paint Paris and life. In room No. 5, 68 Bayard St., where all the members of the Gee family meet to feel the comfort derived from family ties, Gee Wing Yun, the young artist, unpacked case after case of his paintings. Since the days of the Sung Dynasty, 750 years ago, these has not come out from among the Chinese people such a promising artist as this boy of 20, the Chinese say. They are secretly very proud of him. Chinese artists who aping on canvas are almost as scarce as a century plant blossom. This modern realist takes to the street to paint, and commands his followers to do likewise. 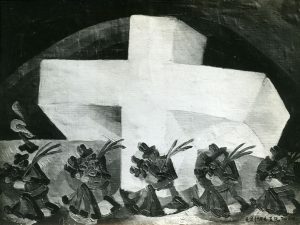 Nothing could have revealed more clearly his insight into the sad trend of the times the picture he called “Soldiers of the Cross.” A great white cross, so full of light that it pierced the deep surrounding gloom filled one canvas, save for the bent, laden figures of soldiers hurrying by at the foot of it, apparently unheeding its light. “Now that you see so clearly this tragedy in our modern age, can you see how to remedy it?” asked one of the group that sat so quietly around that array of paintings and their creator. Six years ago, Yun came to San Francisco. Otis Oldfield, the cubist artist, saw the promise in this young spirit from the Orient. After Yun had broken away from the, for him, too conservative California Art School, Madison Hill, San Francisco, Mr. Oldfield took him under his wing and taught him the cubistic style. But Yun craved freedom. Only a year and a half did he study under a teacher, and then broke away for himself, and, together with 10 other art students, four women and six men, started on what they dubbed “The Modern Gallery” at 718 Montgomery Street, Chinatown, San Francisco, and began to exhibit. The first exhibit drew 500 people, and Yun sold 10 of his pictures on the spot. 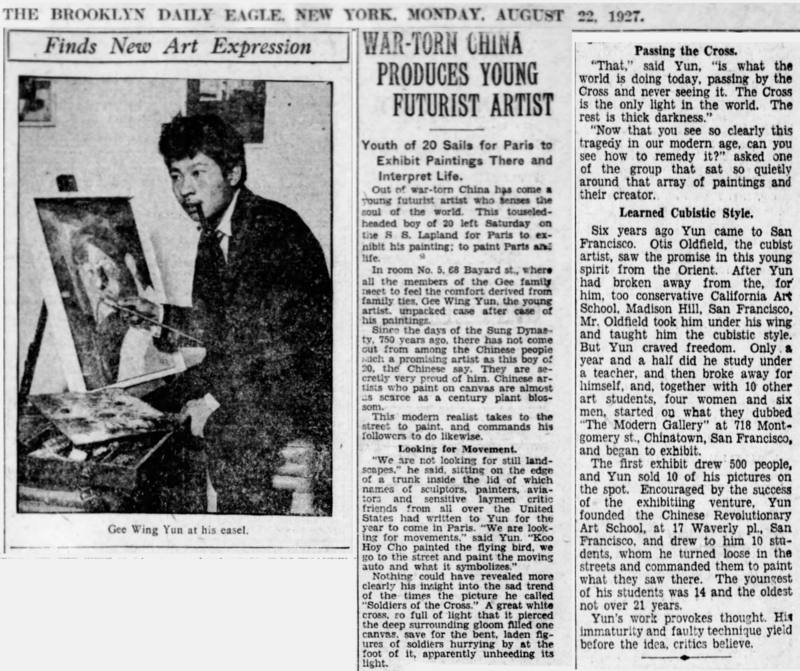 Encouraged by the success of the exhibiting venture, Yun founded the Chinese Revolutionary Art School, at 17 Waverly Place, San Francisco, and drew to him 10 students, whom he turned loose in the streets and commanded them to paint what they saw there. The youngest of his students was 14 and the oldest not over 21 years. Yun’s work provokes thought. His immaturity and faulty technique yield before the idea, critics believe.